I spent the last few days finishing up my postage stamp quilt. This has been on my quilting bucket list for a while and I can definitely see myself making another. It took some time to piece all of the little squares (they are 2" finished), but I did them a little here and there and now and it felt like it went pretty fast. I decided to make this quilt after buying Sunday Morning quilts. Eventually I would like to make most of the quilts in the book and I didn't really need the book to make this one since it is pretty simple, but just seeing the quilt in the book inspired me to make it now. My plan was alternate to darker and lighter value squares, but more importantly I just wanted to use up the scraps that I had so this was more successful in some areas than others. My kids really like that they can find pieces of their quilts in this one and I think it will get a lot of use. The backing is Folksy Flannel which is AMAZING. Everything should be printed on that flannel. The quilt is twin sized and if we lived somewhere colder it would make a great winter quilt for my daughter's bed. Maybe someday. The binding is one of my favorite prints of all time, sundials in amethyst from Field Study, with a little strip of another Field Study print since I didn't quite have enough. 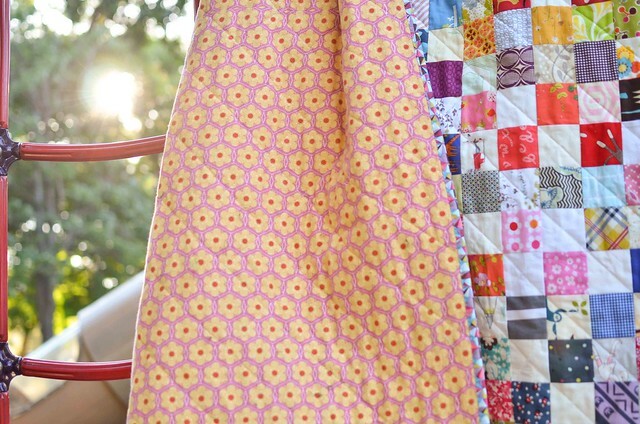 I love this quilt Erica - especially the way you distributed the fabrics! And I agree about the folksy flannel. Oh wow!!! Your quilt is absolutely stunning!!! I really connect with it. You inspire me to make my own. Absolutely beautiful, Erica! I love the way this turned out!! Very nice! And how fun for your kids to recognize the fabrics. So gorgeous Erica! In the photo where it's laid out on the grass it looks like there are all sorts of secondary patterns happening as well as the light/dark effect - it gives this quilt such interest. I'm sure I could sit and stare at all the different fabrics you used for ages! How fun that it's like an I spy for your kids. Nicely done. This is one sweet scrappy quilt! Fabulous finish. Love everything about it. Love, love, love this one. Absolutely scrapalicious! You did a great job with your color values. Very nice! So very cool. One of my favorite types of quilts. I love this! Every time isee a postage stamp I want to make one...maybe when I have more scraps! This is such an awesome quilt! You're going to make me move a postage stamp quilt way up on my must-make list! It's stunning Erica, and such a great size. Love that flannel as well! Nicely done! 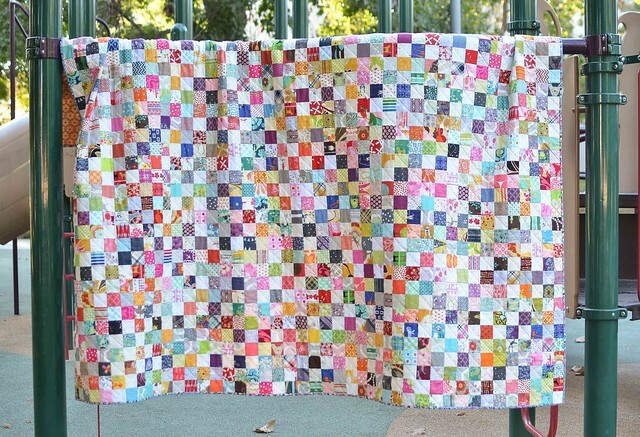 I'm about ready to make a scrappy quilt just like this one. Thanks for the inspiration! It turned out so nice! It looks so cozy and snuggly! so lovely! I love postage stamps! I love your quilt. That's a great use of scraps. Now I'm inspired to try one! It looks great the alternating values are a great idea. fantastic quilt, Erica! I really need to do something like this with all my scraps! Don't you absolutely LOVE AMH flannels?! I backed a quilt with Loulouthi flannel recently and it is the coziest quilt ever. The Field Study sundials are my favorite too! Impressive. I have always wanted to do a postage stamp quilt. Love yours. Wow. These are such a lot of work. I haven't finished mine yet, and it may be a while yet before I do. Very impressive. Yours is so fun! Oh my goodness, that's a lot of little squares! It turned out beautifully. I think you have done well to get your darks and lights working. A really special quilt. Agreed - I think the values worked very well. I noticed them before I read about them, but only after looking a bit. I like a pattern that doesn't slap you in the face. This really is a great one for using up scraps. Someday! The more I study this quilt, the more I love it. You did such an excellent job of balancing the values. So gorgeous. How about you check out this spy application. It may help you keep eye on your kid.